Although Mrs Isherwood’s first setter, Ben, was a show dog (generally larger than their working counterparts, with deeper chests and domed heads), it wasn’t long before the breed’s natural hunting ability led her to a field trial. ‘I saw this hunting trait coming out, even in the show dogs,’ she explains. ‘We lived in Wiltshire then, and I used to stand on Salisbury Plain whistling when the dogs were quartering miles away. The first time I went to a breed stake and watched those dogs working on the hill, my throat was raw with emotion.’ Mrs Isherwood’s husband, Les, began training the couple’s own field-trial champion, Upperwood Jan The Jewel of Laverstoke. Both competed with her, winning five open stakes on partridge, pheasant and grouse, and, 20 years on from that first field trial, the handsome dogs in the couple’s smart duck-egg-blue-painted kennels are all descended from Jan and, as honorary treasurer of the English Setter Club (www. englishsetterclub.co.uk)-the oldest gundog club running under Kennel Club (KC) rules-Mrs Isherwood is fully immersed in the world of working setters. With its flecked, flowing coat (the flecking is known as ‘belton’, in blue, orange or lemon), long, feathered tail and fluent action, the graceful English setter is widely regarded as the gentleman of the shooting field. 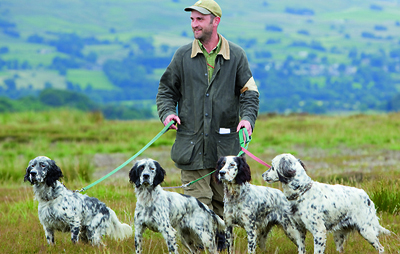 One of our oldest breeds of gundog, whose history can be traced back to the 14th century, a setter’s sporting prowess is demonstrated by its ability to range freely over open terrain in search of game, abruptly coming to a halt on air-scenting its quarry, crouching (or setting) and remaining motionless, to indicate a bird. These qualities were first described in print by John Caius, who wrote in the 1576 book Of Englishe Dogges: ‘These attend diligently vpon theyr Master … when he hath founde the byrde, he keepeth sure and fast silence, he stayeth his steppes and will proceede no further, and with a close, couert, watching eye, layeth his belly to the grounde and so creepeth forward like a worme.’ In Tudor times, setters-then known as setting spaniels-were used to locate game birds, which were then caught in nets or by falcons. By the 18th century, when muzzle-loading guns replaced the net, the dogs became more commonly known as setters. There are four types of setter: English, Irish, Irish red and white and Gordon (a black-and-tan setter established by the Duke of Gordon). Thought to be descended from spaniels, setters didn’t separate into the breeds we know today until the 19th century, although there were various strains named after the aristocratic families who kept them (such as Lord Lovat, the Earl of Seafield and the Earl of Derby). Today’s setter, a registered KC breed since 1873, owes much to Edward Laverack (1800-77) and Richard Purcell Llewellin (1840-1925), who developed showing and working strains of the dog. For Bettie Town, president of the English Setter Club, the breed’s appeal lies in the dog’s kindly nature, elegance and quick brain. ‘English setters are the cleverest of all the pointing breeds; they make great pets and are superb with children,’ she says. Despite being in her eighties, she’s lost none of her enthusiasm for the dogs she’s worked and shot over for more than 50 years. Although the KC’s announcement came as a shock to all setter clubs, Mrs Isherwood admits there are issues that need to be addressed. ‘I do think the breed is in trouble, particularly on the show side, where the gene pool has reduced over the years. There’s such a small band of us on the working side that we’ve always been aware of our gene pool and tried not to let old lines go. This is something that’s sneaked up on the show world.’ When lifestyles changed after the Second World War, many setters were exported to Norway, Sweden, Denmark, Italy, America and New Zealand. In recent years, workingsetter enthusiasts have been tracking down these invaluable breeding lines in order to expand the UK gene pool. Setters reached the height of their popularity in the late 1960s, 1970s and 1980s, with an all-time high of 1,344 registered puppies in 1974. For many, part of the magic lies in the dogs’ graceful gallop-‘An Italian gentleman once told me that you ought to be able to balance a glass of Champagne on the back of an English setter when it’s galloping,’ says Mrs Town-and superlative hunting ability. ‘When I walk up to a “staunch point”, I still get a thrill, even after all these years,’ she admits. ‘I never cease to be amazed at the way they gallop flat out and stop straight away when they wind a bird. How they can scent a grouse when the heather’s in flower, I shall never know. I can remember getting home at night with our clothes smelling of honey and the dogs’ noses caked with pollen.’ And Mrs Isherwood muses: ‘They’ve got a lovely flow to them-it’s as if they’re riding the heather. The bird is the drug for the dog and the dog is your drug.’ And yet for dogs that are happy to work independently, yards ahead of their handler, they also crave intimacy. ‘They love people and like to be near you, to touch you and to know you’re there,’ says Mrs Isherwood. ‘The breeder I got my first setter from said: “You won’t stop at one.” And she was right-you don’t.